Hello and thank you for taking a little time to read a bit about me. I live in rural Fife in Scotland. 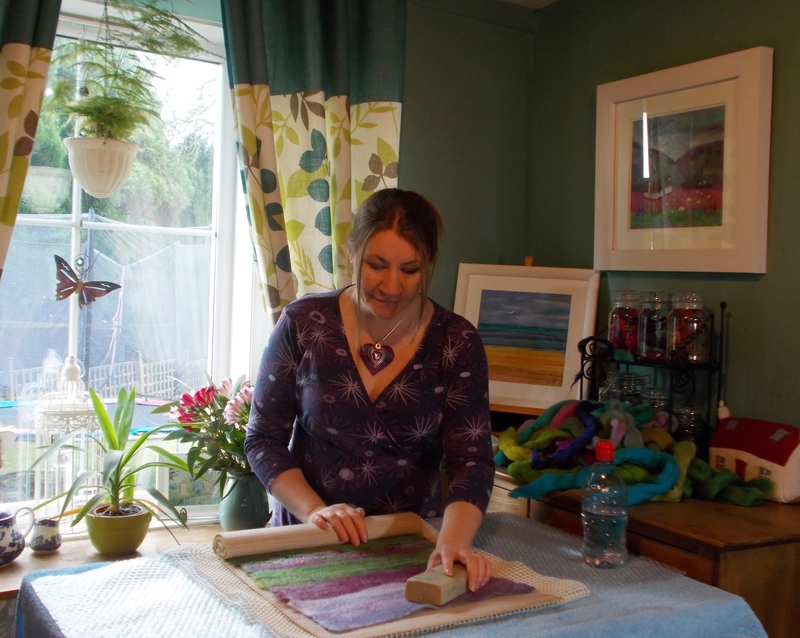 I am an Artist/Maker, working from my cottage studio here in the beautiful Fife countryside. I went to art college in the 1990's to study design then went into floristry for many years. I have since built up a flourishing cottage industry over the past few years making my Fibre Art and Textile Jewellery. I mostly use the wet felting and needle felting techniques in my work as well as the fabulous needle felting embellisher machine. I like experimenting with colour and texture and the embellisher allows me to include a lot of different fibres and textiles, not just wool. I love hand dyed fibres and chunky hand spun yarns and make a point of supporting small independent dyers and spinners from all over the UK. My work is available to buy via my Etsy shop and directly from me at various events throughout the year. There are a few galleries and shops selling my work around Scotland but the full range is only available from me. Feel free to get in touch with any questions, I am happy to consider commission pieces.